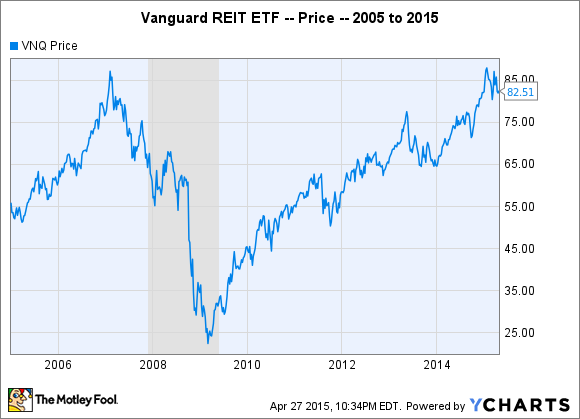 Are Dividend-Paying REITs Right For You? Great investments have come and gone, but few have proven to be more reliable, and created more wealth over time than real estate. The simple question is: What is the best way for you to invest in this potentially lucrative asset class? There are certainly advantages to owning your own rental property, but for my money, I think there are five reasons investing in real estate investment trusts may be the right choice for you. Not every investor has the financial means or expertise to buy their own rental property. This in fact was one of the driving forces behind the creation of REITs in 1960. REITs own and manage portfolios of income-producing real estate, and they avoid paying corporate tax in exchange for distributing 90% of their taxable income to shareholders. Most important, because many REITs trade on the stock market, you can start investing in them with as little as a few hundred dollars. This makes investing in REITs, and capturing dividend yields which average around 3.5%, more accessible. While most investors could always get a loan to buy property, doing so still likely wouldn't allow you to pull together enough money to buy a data center, mall, luxury hotel, or hospital. REITs, on the other hand, not only have teams of experts with access to the latest deals, they can also raise money by issuing new shares of stock. Not to mention, because many REITs are highly credit-worthy borrowers, they can issue bonds and raise debt at significantly lower interest rates than the average investor. In my opinion, the idea that the housing or commercial real estate market is more stable than the stock market is an illusion. The stock market will rise and fall, just like the real estate market will go through supply and demand cycles where rental rates and property values rise and fall. However, since prices aren't thrown in your face every day, it may seem like real estate properties are more stable. Considering this includes the greatest financial crisis since the Great Depression, I'd say it's pretty darn stable. In fact, you would have collected over $500 exclusively in dividends -- or an annual compound return of 4.3%. Despite this fairly consistent payout, when you pull back the curtain you see how wildly the price was changing during the last decade. If you bought in 2005 and sold today, you would have doubled your money -- which is a compound annual return of 7.3%. Even better, if you reinvested your dividends, you would have pumped up your annual return to 9.1% -- which would have turned $1,000 into $2,400. REITs own everything from apartments to cell towers to timberlands. This vast diversity means that if one sector of the economy isn't performing, there is a good chance another will make up the slack. The financial crisis is a good example of this. Although the vast majority of REITs were getting hammered, many companies renting to tenants in need-based industries like health care and senior housing, or low-cost industries like dollar stores and wholesale clubs, were increasing their dividends through 2008 and 2009. On a company-by-company basis, REITs will own dozens of properties on the low-end, and thousands on the high-end. Larger REITs -- those with a market cap of $1 billion or more -- are also typically widely diversified geographically, as well as by the number and type of tenants they lease properties to. The net result is a more stable and predictable cash flow. Suffice it to say, as an individual investor, you can't get this kind of wide-reaching diversity by owning your own rental properties. Because real estate is an illiquid asset, it can be hard to sell. But not so with REITs. Because they trade on the public markets, you can get out with the click of a few buttons if circumstances change and you want out. There you have it, five advantages of investing in REITs. Could I go on? You bet I could. The fact is, there are a lot of great reasons to consider investing in REITs, but only you can decide if they are right for you. And once you decide the answer is yes, check out these three REITs that have been raising their dividend for twenty consecutive years.